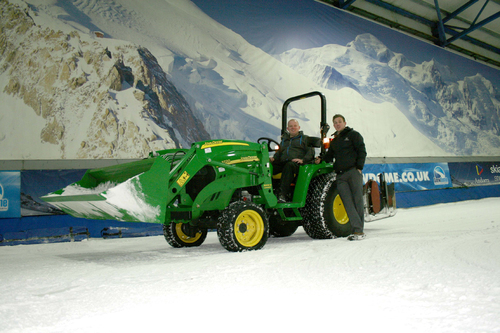 John Deere compact tractors supplied by Midlands dealer Farol play a critical part in keeping the snow covered slopes at the SnowDome in Tamworth in pristine condition. ‘The ultimate snow, ice and leisure experience’ is the proud boast of the SnowDome, for the composition of the snow on its 170m long x 30m wide main ski run, two academy slopes and children's snow play area. And the formula of the snow, which is manufactured within the building, is like that of Coca Cola – a closely guarded secret. “When the SnowDome opened in 1994 it was the first venue of its type in the UK and only the second in the world,” says operations manager James Smith, who leads a 15-strong technical services team that includes the snow and ice groomers. Skiing naturally moves the snow sideways and pulls it down to the bottom of the run. Maintaining the degree of powder required and its depth involves pushing the material back up the slope and decompacting it. These regrooming operations are carried out twice every day and throughout the night, with the power provided by a John Deere 60hp 4520 fitted with a 400CX front loader and a 44hp 3720 with a 300CX loader, both fitted with 61in high volume Jumbo materials buckets. The tractors were delivered earlier this year by Farol’s Hinckley outlet on a two-year lease contract with a 1000 hours a year service clause, in an initial package that also included a Gator 6x4 utility vehicle. As a result of the success of these John Deere machines, the SnowDome has more recently taken delivery of two new 2032R 32hp compact tractors with H130 loaders and 51in materials buckets, which are used to maintain the snow on the academy slopes and the snow play area.